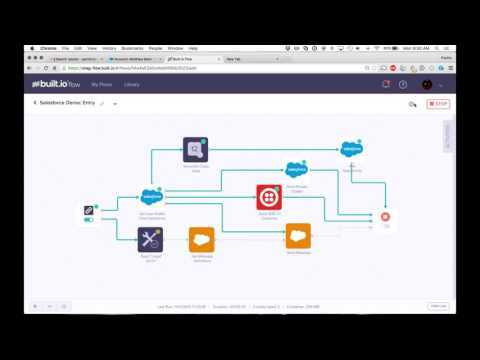 Built.io Flow is a cloud-based integration platform-as-a-service (IPaaS) designed to provide end-to-end integration and business process automation for IT admins, developers, and business users. The Express edition is designed with a point-and-click interface for business users to create automated workflows without requiring the input of the IT department, and the Enterprise edition is suited more for technical teams, with a drag-and-drop interface, API builder, and custom code editor. Built.io Flow Enterprise enables users to connect their cloud services, mobile applications, legacy enterprise systems, and IoT (Internet of Things) infrastructure, and manage workflows across these domains. Complex workflows can be created with custom logic, loops, and multiple execution branches, and collaboration bots can be included to enable workflow triggers within chats, such as booking conference rooms, setting up dial-in numbers, and synchronizing participants’ calendars while users coordinate a meeting. The built-in data mapper normalizes data between multiple sources, allowing data to be reconciled between systems. Built.io Flow Enterprise also includes custom Node.js code blocks, support for Swagger and RAML, and advanced API builder, visual testing and debugging, and more. Workflows can be created and mapped to real business processes, with custom logic, loops, and multiple execution branches. Collaboration Bots enable users to trigger workflows from within collaboration tools including Slack or Cisco Spark, such as booking a conference room, setting up a dial-in number, and syncing with participant’s calendars, all while coordinating the meeting. Built-in data mapper transforms data for transfer between heterogeneous systems that use different formats or nomenclature, such as Marketo and Salesforce. Real-time triggers can be used to initiate simple or complex workflows spanning multiple systems, such as adding a lead to the CRM system, creating a note in Evernote, and sending an SMS or Slack notification when a task is entered in Trello. Meta-APIs can be created using the advanced API builder to combine, wrap, and abstract multiple API calls into a single one, which can be exposed with a simple URL. Below are some frequently asked questions for Built.io Flow. Q. What type of pricing plans does Built.io Flow offer? Q. Who are the typical users of Built.io Flow? Q. What languages does Built.io Flow support? Q. Does Built.io Flow support mobile devices? Q. Does Built.io Flow offer an API? No, Built.io Flow does not have an API available. Q. What other apps does Built.io Flow integrate with? Q. What level of support does Built.io Flow offer? Q. Which apps is Built.io Flow compared to most often?